The statistic shows the number of ESPRIT points of sale worldwide from 2009 to 2014, by region. 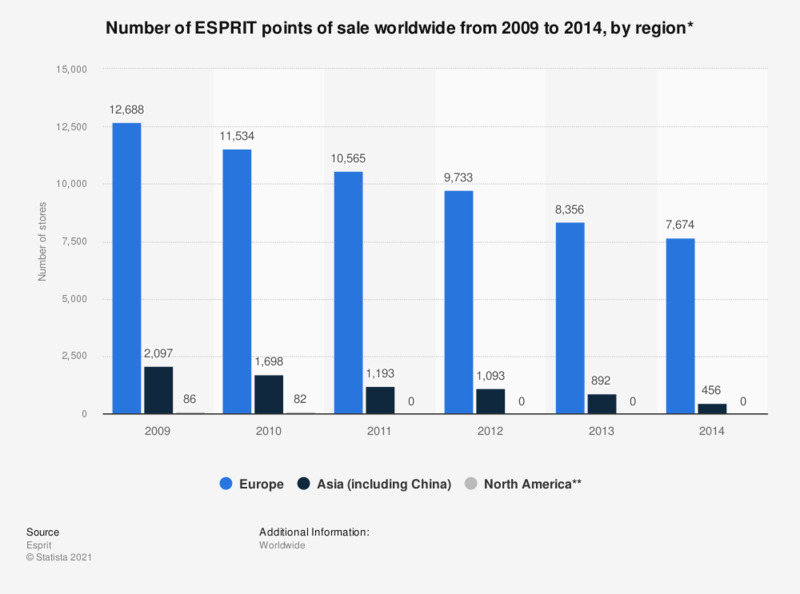 In 2011, Europe accounted for 10565 points of sale, where ESPRIT products have been sold. The ESPRIT brand is owned by the ESPRIT Holding. The corporation operates in the fashion and retail industry and sells apparel, footwear, accessories, jewelry, and house wares under the brand label. * Includes franchise stores, shop-in-stores, and identity corners. ** ESPRIT left the marketplace in North America in 2011. Data for 2009 to 2013 are derived from previous editions of the publication.